If I name a goat ‘DOG’, is it still a goat? I try not to post more than once in a day… for a couple of reasons. But I had to share this. With the smoker loaded and the kitchen finally cleaned up after last night’s fish processing… I got some laundry going, got the stuff that was making my truck smell like a dead fish into the laundry and was working on my next to-do when I realized I was hungry. I decided it was time for a snack. 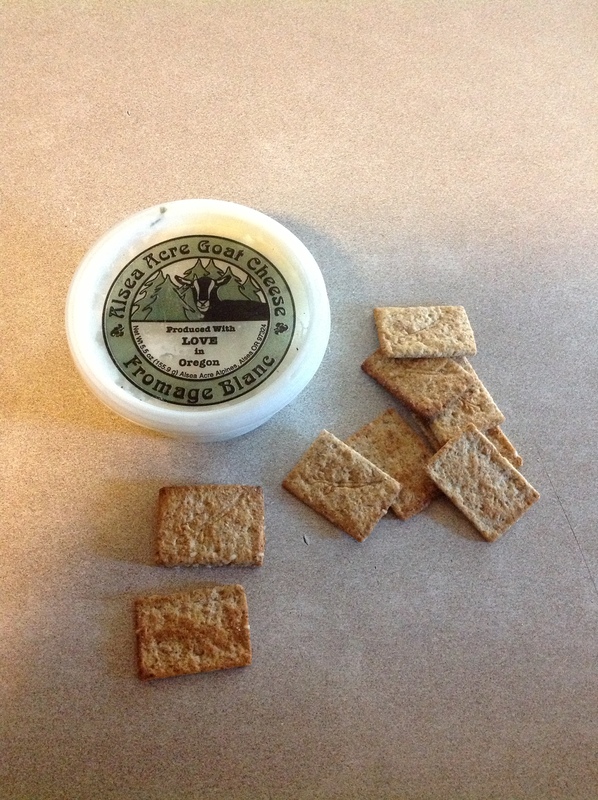 I had picked up this container of Goat Cheese while Dave and I fished the Alsea on Sunday. We stopped into John Boy’s Alsea Mercantile, (I’m a sucker for General Stores – doesn’t matter where I am, or what I’m doing, I love them and have to stop) and there was a sign for locally made goat cheese from a farm near town called Alsea Acres Alpines. I like goat cheese, I like general stores, and I like supporting local farms… I had no choice but to pick some up. I bought one of the containers of Garlic/Chive, and finally had an excuse to give it a taste. Not just good, but crazy good. Very pleasant taste, not too overpowering, a bit lemony, soft and light and DELICIOUS with crackers. (Is it too early to have a glass of wine?) I don’t know if you can find it online or not, but I can tell you right now – the next time I head down to the Alsea to fish, I’m grabbing some more. YUM! Gotta go, have to fight Shannon for some more before its gone.